James Robertson stands alongside two Scottish internationals. Believed to be the world’s first known black rugby player, in the 1870s, you would have expected James Robertson to have endured significant social barriers due to his skin colour. But on the contrary, research suggests he was accepted and integrated into Edinburgh life and culture, going on to have a successful career both in the sport and in his line of work. After looking closely at the team photograph of the Royal High School Former Pupils team from 1871, it came as a surprise to Andy Mitchell that one player in the team of rugby players was black. 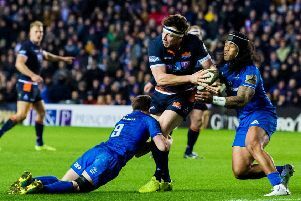 The Scottish sport historian was intrigued and vowed to discover the story of the man captioned as “JG Robertson” who he believes could be the world’s first black rugby player. It has taken a more than a year since first discovering the image to unravel the fascinating story of how Robertson became a prominent rugby star on both sides of the Border. The Royal High School website says Robertson played 46 games between 1871 and 1875. In the image he is stood alongside Scottish internationals Angus Buchanan and Alexander Petrie. He appears in two more team photos, and also made four appearances for the Edinburgh representative team against Glasgow. But aside from that, he is barely mentioned in sports histories. There was no JG Robertson in the 1871 or 1881 census in Edinburgh, and there was no-one of his name in the Royal High School archives. James is the eldest son of Perthshire-born surgeon Dr Daniel Robertson, who had travelled to Gambia in 1834 after graduating from Edinburgh University. He became a colonial secretary, devoting his entire working life to Gambia and spent more than 30 years there before retiring in the mid-1860s. It is assumed he had a relationship with a Gambian woman which produced two sons: James George Robertson who was born around 1854 in Bathurst, Gambia, and his younger brother, John, three years later. James was sent to Scotland for his education, initially boarding in Crieff before going to live in St Andrews, where his father and younger brother joined him. James attended Madras College from 1866-70, did well educationally and matriculated at St Andrews University in 1870, but left after his first year. In the autumn of 1871 he went to Edinburgh University to study medicine, and throughout his five years in the Capital he played rugby for Royal High School FPs. Andy said: “It would have been natural for him to join the university’s thriving sports teams, yet he chose not to. The obvious question is ‘Why?’ as the major unknown factor in this story is the lack of an obvious connection between him and the school. One can speculate that he may have gone to the Royal High as a boy, or his father had a connection, but I have not yet found any proof.” A talented forward with a knack of scoring key tries, Robertson found acceptance playing rugby within the city. He first played against Glasgow on December 6, 1873 and made another three appearances in the two years that followed. Despite the games effectively being international trials, he was never touted as a possible player for his country. In 1876, Robertson graduated from Edinburgh University with a degree in medicine and surgery and found his first job in County Durham, where he was appointed resident medical officer at Gateshead Dispensary. It was not the end of his rugby days by any means and over the next few years he played regularly. He first appeared for Northumberland early in 1878, before going on to captain the North Durham club, based in Gateshead, from 1879-82. He may have played for Darlington, too. Andy, 60, said: “There are so few photographs from the 1870s but having spoken to other historians, they have not been able to give me any other names. I believe his story may not have been told before because he was not an international. Credit to him for going on to have a successful career. Robertson went on to marry Emily Joel in Newcastle in 1879 and the couple had three sons and a daughter. The 1891 census shows the family living in Gateshead, joined by James’s father. However, Daniel died in 1892. Two years later James purchased a medical practice in Ashwell, Hertfordshire. He became a prominent figure in local life, not only as the town’s doctor but also as president of Ashwell Tennis Club and a committee member for the cricket club. However, his life ended unexpectedly in February 1900 after collapsing at home and dying in front of his wife at the age of 46. The funeral attracted more 300 mourners and he was buried in St Mary’s Churchyard. Andy says Robertson’s story is an important one with being the first known black player of any code, yet he failed to find a single reference to his colour in contemporary accounts. He said: “There is virtually nothing to indicate that he suffered discrimination due to his colour. This raises the question as to whether his social class allowed them to rise above racial discrimination.